A tankless electric water heater is a great purchase if you’re looking to make your home more modern and efficient. No more waiting minutes on end for hot water to start flowing in your sink or shower – with a tankless electric water heater, you can get warmed up right away, whenever you want. Tankless electric water heaters have become very popular recently. Companies have taken notice of this and begun expanding their selections. 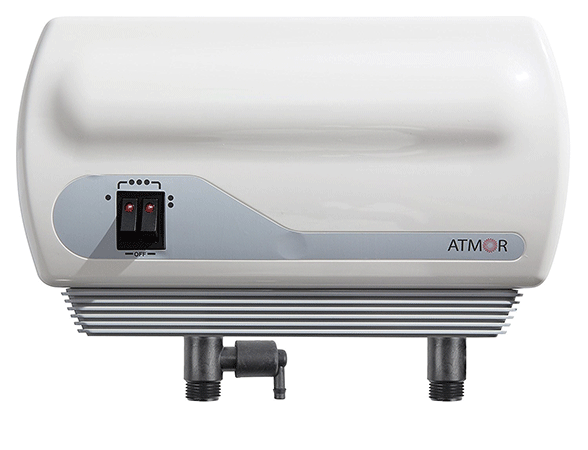 The Atmor AT-D24TP-AZ is a tankless electric water heater that offers super fast water heating at a low price. ThermoPro technology provides maximum energy efficiency by regulating water flow and energy usage depending on the temperature of the water. This means big savings on your electric bill, especially if you’re switching from an old tank-style water heater. 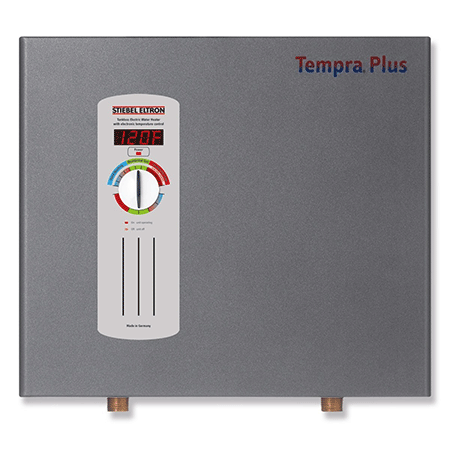 It is also one of the only tankless electric water heaters to be IP54-certified splash resistant. The AT-D24TP-AZ is most ideal for small to medium sized homes in warm climates, as it can handle up to four applications at once with an incoming water temperature of 73 degrees Fahrenheit. It may not be the best option for larger homes or colder areas. 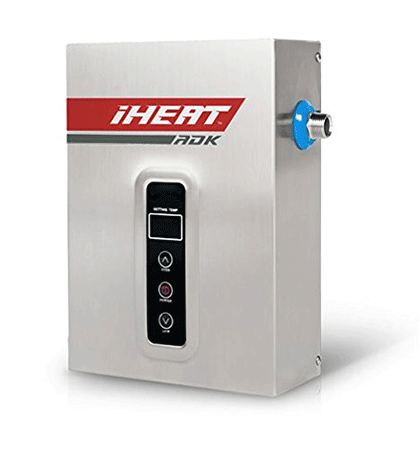 The iHeat Tankless S-16 water heater has an extremely small form factor, making it a great option for small spaces such as utility closets. It can heat 3.5 gallons per minute, enough for two showers and one sink in warm climates. Colder climates will be limited to point of use application – that is, one application per heater. One thing to consider with this water heater is that low-flow fixtures will allow the water to get hotter. Switching your showers and faucets to low-flow fixtures will produce more efficient results. 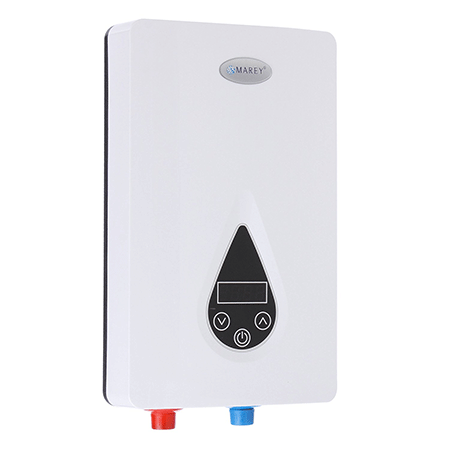 The Marey ECO 110 tankless electric water heater has very low energy consumption, using only 12.6 KW. It is also compact and lightweight. The price is quite affordable compared to other water heaters. The ECO 110 claims to output 3 gallons per minute but many reviewers say that this figure is too high. It is best suited for a very small home, cabin or workshop where only one appliance will be using hot water at a time. Colder climates will probably require a more powerful heater than this. 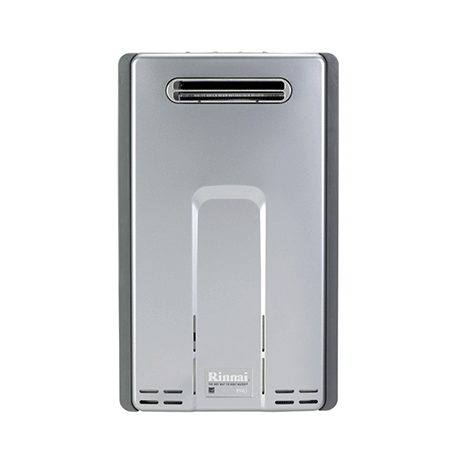 Pricey but powerful, the Rinnai RL94eN tankless electric water heater can output 9.4 gallons per minute, enough to provide hot water to five appliances at once. This whole house water heater is Energy Star certified and has an attractive chrome finish. The RL94eN is intended to be installed outside the house, so installation may be trickier than for other water heaters. It is also quite large and heavy. However, it can provide hot water to the whole house, including in cold temperatures. This is not a tankless electric water heater but is still a very efficient choice. It has a lifetime warranty and once it heats up for the first time it provides hot water surprisingly fast for a tank-style water heater. 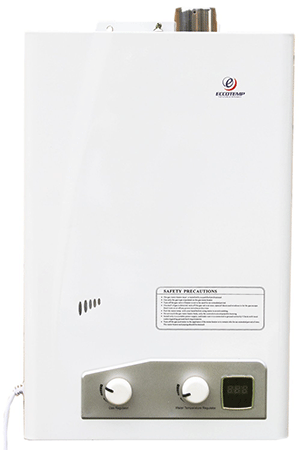 The Westinghouse water heater boasts 98% thermal efficiency and a long-lasting stainless steel construction. 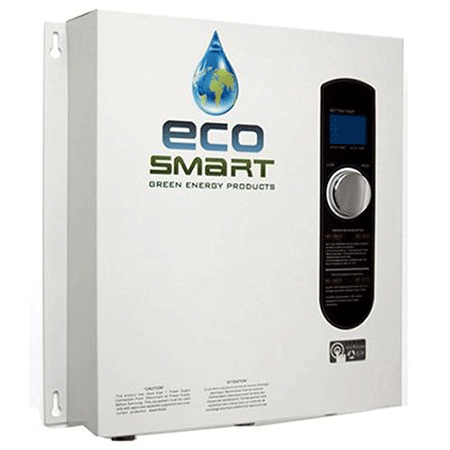 This 28.8 KW tankless electric water heater is a very innovative option. Made in Germany, this heater is unique in that it does not require venting. Users report getting around 4.5 gallons per minute from the heater, which is enough for a medium sized home. The Stiebel Eltron’s water flow sensors allow it to constrain energy usage for a lower electric bill. The FVI-12-NG is a tankless gas water heater that can output up to 4 gallons per minute. Because it heats with natural gas, electricity consumption is very low – only 10 watts while operating. If you do not have a natural gas supply, however, this heater cannot be used. It requires venting as natural gas fumes must be vented outside. The heater is well-built and simple to adjust. 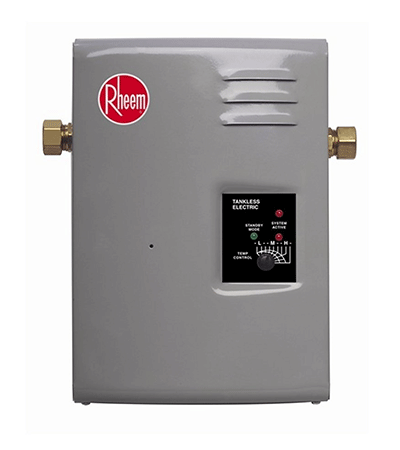 The Rheem RTE 9 is ideal for point-of-use application. This tankless electric water heater works best when it provides hot water to only one fixture or appliance. Due to its low power it does not work well in the cold. At its maximum output of 3 gallons per minute it can raise the temperature of the water by 30 degrees Fahrenheit. It is easy to install and set up. Using 27 KW and outputting up to 6 gallons per minute, the ECO 27 uses patented self-modulating technology to save power. The tankless electric water heater is large and powerful, best suited for northern homes and low water temperatures. It can output up to 3 gallons per minute with incoming water temperatures of 37 degrees Fahrenheit. Digital temperature control makes it easy to set up. This extremely affordable tankless electric water heater is designed for point-of-use installation. It can output 0.5 gallons per minute, which makes it best used to heat water for a single sink. It works best when incoming water temperatures are over 57 degrees Fahrenheit. It is very small and is able to be installed easily and discreetly under the sink.